Concrete, while inexpensive, is prone to cracking. It will need to be repaired over time. Stamped concrete, done professionally, can be mistaken for the real material it is patterned after. Natural stone is durable, as is wood, but the latter will require more maintenance. 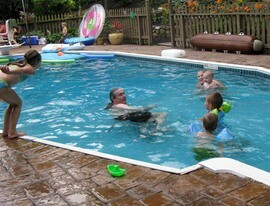 Regular concrete is the most economical pool surround option at $2 to $5 per square foot. Stamped concrete runs from $6 to $15 per square foot. Natural stone costs approximately $15 to $30 per square foot. The cost of wood decking ranges between $15 (for a lower-grade wood) to roughly $35 (for a higher-grade material). Composite decking is approximately $30 to $35 per square foot.